Gutter cleaning and downspout cleaning is a very important part of the preventative maintenance of your home. Gutters, if not cleaned regularly and properly, could lead to far worse problems. 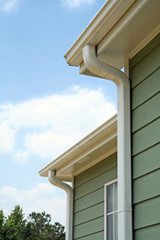 The gutters and downspouts are designed to carry water away from the foundation and surfaces of your home. The pros at DFW Finishers will keep your gutters clean and working properly, which will keep water from causing damage to your home. We will remove leaves and debris from all those difficult and dangerous places to reach. The specialists at DFW Finishers offer a complete gutter cleaning service. We not only clean the inside of the gutters, but also will also make sure the downspouts are clean and that there are no clogs. We can also do a specialized cleaning black streak removal on the outside surface of the gutters. Your gutters should be cleaned on an annual basis. Depending on the surroundings of your home, your gutters may need to be cleaned twice a year to keep them working properly. DFW Finishers can perform your gutter cleaning maintenance with no hassles, excellent service, and at a discounted rate. DFW Finishers of Holly Springs, NC are: Experienced gutter cleaners including downspout cleaning, rain gutter cleaning, black streak removal, inside gutter cleaning, and outside gutter cleaning; and a Professional gutter cleaning service business in the Raleigh, NC area. We service the areas of Cary, Holly Springs, Fuquay-Varina, Apex, Raleigh, Morrisville, Garner, and Durham, NC.